I have thoroughly enjoyed learning some amazing creative skills for all of these products. 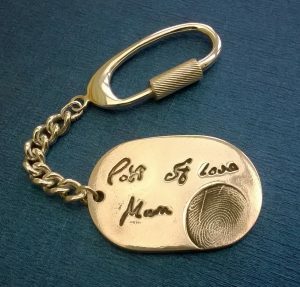 There are several steps involved for each but read more below to find out how these beautiful keepsakes are made and the order process for them. Fingerprints are captured using moulding putty – small balls of blue and white putty which harden once they are combined. 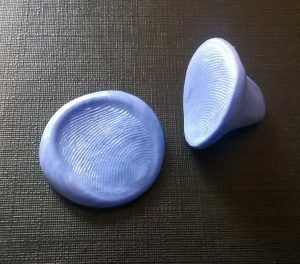 So you just roll the two balls into one, gently press the finger into it and leave it for about 10 minutes until it has fully set. I can take these prints myself if you are local or post kits anywhere in the world, with full, easy-to-follow instructions. Once I have the initial print, I then take a reverse mould of it using the same type of putty. Or, for younger children, I prefer to take the reverse mould using crystal resin which picks up the fine detail of younger prints more clearly. This reverse mould is what can then be pressed into the silver clay in the next stage. 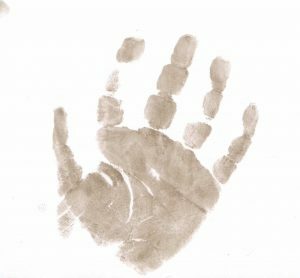 Handprint, footprints or even your pet’s paw prints can all be taken with inkless wipes and specially coated paper. Again, I can either take these myself if you are local or post them anywhere in the world if not. 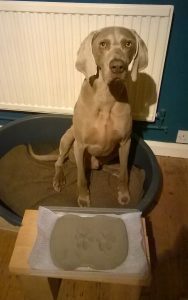 They are very easy to use – like a drier version of a wet wipe, just wipe over the hand, foot or paw and press onto the paper. As they are inkless, they won’t leave any messy ink covered hands and the prints will only appear on the correct, marked side of the paper. Once these prints have been taken, I scan them, shrink them down to the required size for the chosen charm and using some very clever gel sachets and a uv light, make tiny stamps of them – so I now have miniature versions of your prints, still holding the same shape and line detail as on the original full size prints. These stamps are then pressed into the silver clay. Capturing artwork, such as a child’s first drawing, or a short handwritten message or name onto silver creates an amazing keepsake to be treasured forever. Ideally I need a good quality scanned copy of the artwork or handwriting but a clear photo may be ok. This can be emailed or posted to me. I then shrink them down to the required size and make stamps of them, in the same way as I would for hand or footprint stamps – to then be pressed into the silver clay. The fine silver jewellery range starts as a clay form of silver – it is fine silver particles suspended in an organic binder along with some water too. It can be shaped, rolled, cut out and then stamped with your chosen prints and names. I then leave it to fully dry for a day or two to ensure all moisture is removed and sand down any rough edges before firing it – this burns away the binders and forces the molecules of silver together. During this part of the process, the charms will shrink slightly but prints stamped into the clay still maintain their shape and design. The result is a solid piece of 99.9% fine silver – clever stuff! At this stage, the silver is in its natural form and a pearly white colour. Lots and lots of brushing and polishing is now needed to give a beautiful mirror-finish shine. As a comparison to 99.9% fine silver, Sterling Silver is 92.5% silver, with other metals added to strengthen it. I absolutely love using this silver clay product and with knowledge and experience of shaping the clay, the possibilities are endless! Home visits are needed for these keepsakes where hand, foot or even pet paw prints are gently pressed into rolled clay to take the impressions. Back in the studio, I then fill this impression with casting material to capture the prints. This then has to be left for a couple of weeks to fully dry before sanding and applying your chosen finish. These can be supplied on a stand or framed with or without a photo. Framed impressions can include prints from one child or two or three siblings. 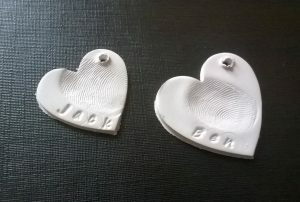 3D castings are the latest product to add to my range of keepsakes and they immediately became my favourite! Home visits are essential for these, where the impression powder (known as alginate) is mixed with water. We then have just a couple of minutes to capture a mould of your child’s hand or foot as the alginate sets around it. While calm, still hands would be perfect, we know that isn’t always possible! We can try to distract them with feeding time or toys but don’t worry – little wrigglers do not cause as many issues as you may think. The material sets around them but it is still fairly flexible allowing us to easily wriggle their little hands or feet from the mould. I will always take at least two casts – more if I can see any possible imperfections within the mould. Back in the studio, I then fill the mould with the casting material and leave it to set for a few hours before removing the alginate material from around it. 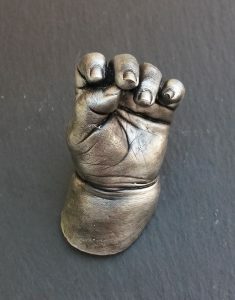 It is only then that we see how the cast really looks and if I’m not completely happy with it then I’ll arrange another home visit to take more casts until we have a perfect keepsake for you to treasure forever – a lasting memory of how small your baby’s hands and feet really were! The cast has to be left to fully dry for a couple of weeks before applying your chosen finish and framing if required.